The hardest part of writing letters to you is the knowledge that you will not read my words and there will be no response. I miss you every day, but some days are particularly difficult. Yesterday, Father’s Day, was one of those days. And yet, there is joy in the midst of the mourning. Joy, because your beautiful legacy lives on. Every time I talk to your grandkids about Jesus, you are present. Every time I sing a song of praise to God, I can hear you singing and I imagine my voice harmonizing with yours. Whenever I pour cereal from a commemorative box, I think of you. When I drink coffee, read my Bible, get excited over a passage of scripture, I think of you. And when my husband preaches, I hear your heart. What a gift your life has been and continues to be to me. I am the richest of girls, blessed beyond measure, because of your humble faithfulness to the Word of God, because of your unending love for Jesus, and because of the way you loved your 3 girls and your devoted wife. 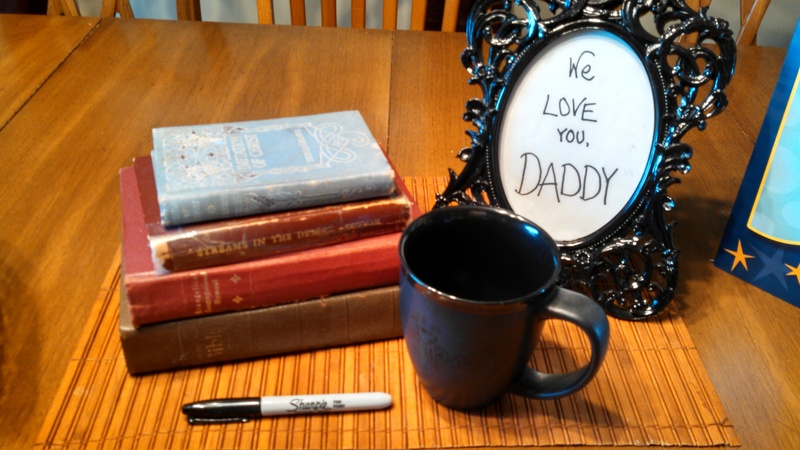 The kids and I put together a Father’s Day centerpiece for their Daddy, but it made me smile, because it was for you too. The books were yours (although I discovered this morning that the Bible was mom’s!) and my husband likes coffee just as much as you do (although I think he might like it even a little more!). The Sharpie was from Ethan who added it because our love for his Daddy is permanent. This sentiment is truly brilliant. It’s how I feel about you, Daddy. Even though I can no longer call you up and hear your voice, even though I don’t get to see you and kiss your cheek when I visit Kansas this summer, even though we will never again walk the hills in Pitman together, my love for you has no end. There is no last in loving you. I can’t wait for that day, Daddy! But until then, I want to live well and honor your beautiful life. I read this verse the other day and I have shared it with many people, but every time I do, I am reminded that I want to share it with you. Daddy- thank you for living your life as one who pleased God. Thank you for seeking His glory in all things. When I am tempted to seek my own glory, your example flashes before me. And you know something else I have come to realize? I chose my husband well, because you led your life well. He had to be a man who loved God, who studied the scriptures, who sought wisdom and humility. He had to be. He’s not quite as goofy as you were Daddy and he doesn’t make up as many silly songs for our kids. However, he does play video games with the kids and he pretty much knows how to figure out everything which makes him infinitely cooler than their Mommy (and this is the part where I wish we were having this conversation in person, so you could see the twinkle in my eye and the smile on my face, because I absolutely love that your grandkids adore their Daddy). Ah, Daddy! I love you so very much. Thank you for being you. I miss you so much that I ache. But I wouldn’t want it any other way, because that simply means that I pretty much had the best Daddy in the world. My eyes are filled with tears, Becky, that is beautiful and healing, as well as, a legacy that you are building with keeping your daddy’s memory alive!